Do you have a large-scale project looming on the horizon? Do you know how you will manage the work to complete the project on-time and on-budget? What happens if you don’t? If you are looking at a huge project and don’t have a clue where to begin, you are not alone. Any successful project starts with a clear map defining what to do, who will do it and when it will be done. Sounds simple…and really, it is. Your team has all the information to complete your project – the knowledge, talents and skills as well as the ability to find the knowledge and skills that are missing. Your task is extracting that knowledge, putting it down in a cohesive one-page project map and then following it through to a successfully completed project. If you don’t know where to start, we can help. Here is how others like you have completed their projects – by using a tool developed to extract the team’s knowledge, then organize and give it back in a one page, visual map. The Dynamic Plan® is a one page chart that shows the flow of tasks, the individuals responsible, and the due dates. We help you each step of the way to assure you are successful. Interested in learning more. Begin by looking at the articles listed below. Both will give you more insight into how to tackle your large-scale project. 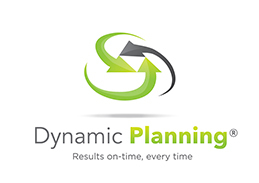 If you want some real-world examples, read some project management case studies about the organizations who have completed Dynamic Planning® and learn how it worked for them, click here. If you have specific questions, contact us for pricing and options for your next project. Want to learn more about project management? From our experience working with clients, we have learned five essential skills to keep your project moving forward. Read our library article Project Management Skills to learn more.